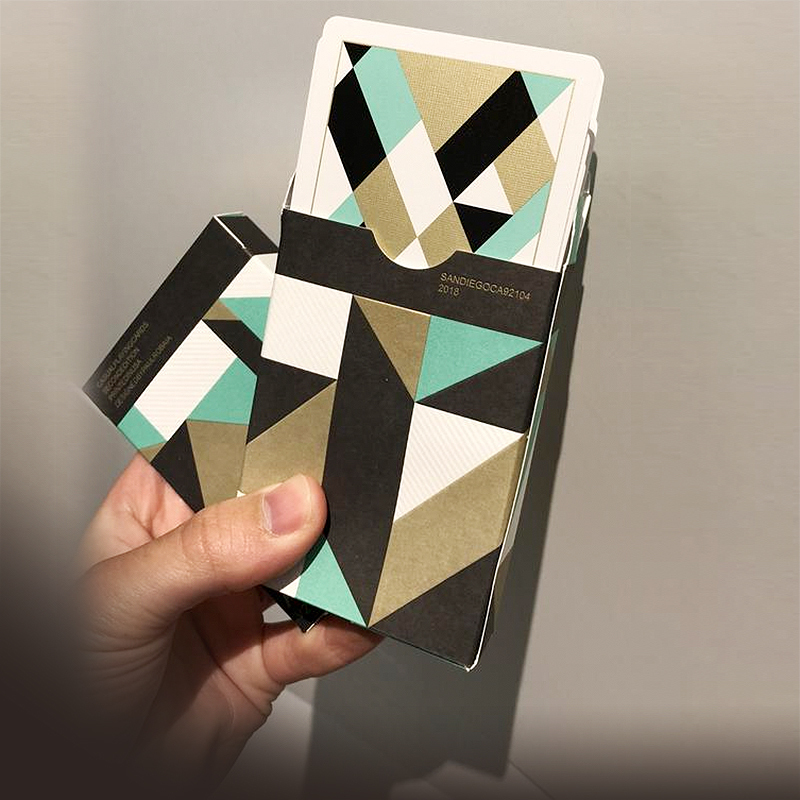 "This is the second edition of Casual Playing Cards. The design, in comparison to the original, has been thoroughly refined. The back sports a clean, geometric pattern with a spectrum of true Pantone and spot colors: mint green, metallic gold, black, and white. The court cards have not only been recolored to compliment the back design but also have been minimalized. It draws inspiration from the original Smoke and Mirrors court cards. The ace of spades is sleek and minimal as well. The joker pays homage to a classic joker seen in decks from The Russell, Morgan & Co in the 1800's; however, it, like the courts, has been stripped of excessive detail to promote minimalism. The tuck case has been beautifully handcrafted by Clove Street Press, a San Diego based, letterpress company; there is a sense of dimensionality with certain objects being embossed and others remaining flat. I have assembled each tuck by hand. Each tuck comes flat, as an uncut sheet. I have folded and glued each tuck. I also have placed the cards inside each tuck case and wrapped each tuck case using a cello machine that only allows me to wrap one deck at a time. Thus, I hope it is recognized that an immense amount of time and care has been put into making this deck of cards."